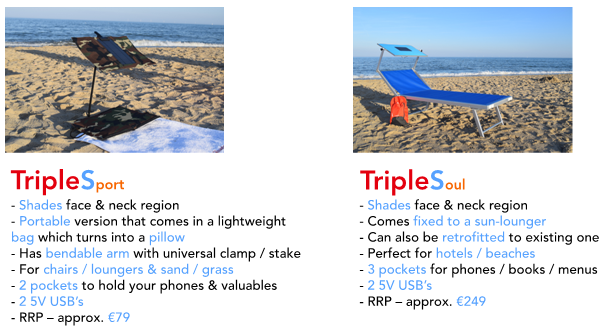 Connect Shade provides you a great opportunity to built a portable and most stunningly designed shades wherever you go. Catch up on the latest product that you won’t want to be without. Invented in 2013 by a teen entrepreneur when he was just 13 years old following a holiday in Italy, the product has just been launched to the market via a Kickstarter campaign. JoshuaDargan Hayes hails from the beautiful region of Wicklow in Ireland where he lives with his parents and younger brother. What has he done? It seems simple and like all good ideas, you think it must have existed already. But no! Joshua, in fact, thought the same, until he started looking for one to find it didn’t exist, so he invented one himself. Now we all know that the sun on your face all day long is very uncomfortable and unhealthy and that battery power in our devices doesn’t last very long nowadays. While away on a family holiday, the teen became aware of how many people, like himself, were using towels or umbrellas or hats to protect themselves, particularly their faces, from the heat and glare of the sun. Being a youngster - who we all know like to stay up to the minute with everything going on in their circle even when they are not present - when his phone starting running out of battery he thought why couldn’t he use the beaming sun rays for some useful purpose like powering his phone. And so, ‘Connect Shade’ was born. At Connect Shade, they have designed a shade that is not only perfect for the typical beach location but can also be used in the park, on your deck at home or even out camping. It removes ‘power anxiety’ and provides a freely available power source when and where you need it.It can act as a positive contribution to the defense against skin cancer. The next-gen sunshade can allow babies and young children to nap out of the damaging sun rays while being kept cool by a fan while their parents enjoy their lunch or simply some peace and quiet. They can even watch a movie if they won’t take a nap. Sometimes you just have to give in! 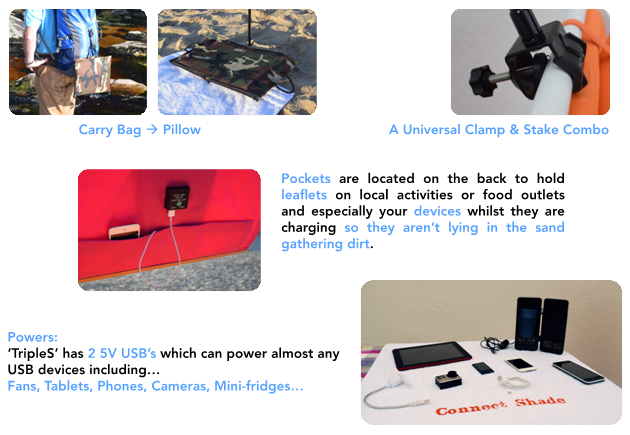 It can also be used to provide free power in locations without access to power, such as in developing countries where it would be great for mobile medical personnel to have access to a power source to keep in contact with base or for teachers to introduce the world of technology to students in remote areas. Why is it unique? Nothing like it exists anywhere. Connect Shade has multiple patents based on the product and company.They believe their product is one for the future, as ‘free’ and ‘green’ are very desirable traits for 21st-century items. 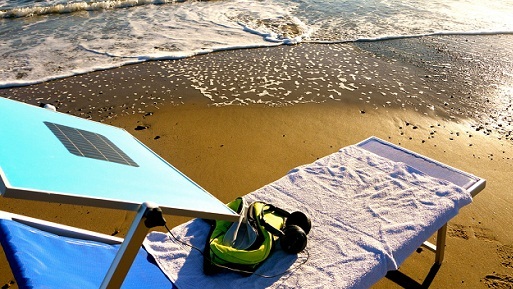 They hope that their product is the one to revolutionize beaches and anywhere else their customers may travel. They also wish to expand the humanitarian aspect. Potential Markets include Corporate (Hotels/Cruise liners/Holiday villages), Retail (Seaside shops/Designer outlets/Online), Municipalities (Town Councils), Manufacturers and Humanitarian Agencies. Potential benefits for customers include branding and customized designs, ability to hold menus and activity programs, large advertising opportunities on a front and back providing extra income, foldable and lightweight versions (for air travel), ability to retrofit to existing sun-loungers, spin-off start-up business opportunities (sunshade rentals, accessories). After being inspired to create Connect Shade, Joshua developed the product as part of a small school mini-business. He has since competed in various national competitions where the product’s attributes have clearly shown themselves to have a winning formula, achieving regional and national awards in science, innovation, and entrepreneurship as well as the coveted Junior Dragons’ Den.After a long prototyping stage as CS moves forward with the crowd-funding campaign, Joshua feels very grateful to have the support of government funding and mentoring and still does, in order to best aim the start-up in the correct direction. You too can be part of the Connect Shade story and help this young entrepreneur on the road to success. Do check it out.